An underwater exploration that overturns myths about fishes and reveals their complex lives, from tool use to social behavior There are more than thirty thousand species of fish--more than all mammals, birds, reptiles, and amphibians combined. But for all their breathtaking diversity and beauty, we rarely consider how fish think, feel, and behave. In What a Fish Knows, the ethologist Jonathan Balcombe takes us under the sea and to the other side of the aquarium glass to reveal what fishes can do, how they do it, and why. 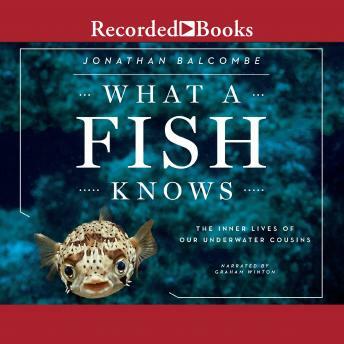 Introducing the latest revelations in animal behavior and biology, Balcombe upends our assumptions about fish, exposing them not as unfeeling, dead-eyed creatures but as sentient, aware, social--even Machiavellian. They conduct elaborate courtship rituals and develop lifelong bonds with shoal-mates. They also plan, hunt cooperatively, use tools, punish wrongdoers, curry favor, and deceive one another. Fish possess sophisticated senses that rival our own. The reef-dwelling damselfish identifies its brethren by face patterns visible only in ultraviolet light, and some species communicate among themselves in murky waters using electric signals. Highlighting these breakthrough discoveries and others from his own encounters with fish, Balcombe inspires a more enlightened appraisal of marine life. An illuminating journey into the world of underwater science, What a Fish Knows will forever change your view of our aquatic cousins--your pet goldfish included.